Cut two apple slices up into small pieces. Put apple pieces into a cocktail shaker. Add one teaspoon of sugar and pinch of cinnamon. Muddle ingredients together using wooden spoon. Measure two ounces of Applejack liqueur and pour into cocktail shaker. Measure two ounces of fresh apple cider and pour it into the cocktail shaker. Add ice to cocktail shaker. Cap with pint glass and shake vigorously. The shaking action not only stirs the drink, it has a muddling effect on the fruit. Prepare a fresh glass with ice and garnish with an apple slice. Strain mix into the glass. For more fruit in your cocktail.pour mixture from shaker using a wooden spoon to hold back the ice cubes. To strain fruit out, use a proper cocktail strainer. If you want to have your favorite fall dessert in liquid form, you need one key ingredient: Applejack. This boozy concoction should be available at your local liquor store – it’s made from apples and was popular during the colonial period in America. To pie-ify your drink, just mix applejack with a little bit of sugar, some spice and fresh apple cider. Check out the full recipe for this fall favorite below. Step 1: Cut two apple slices into small pieces. Step 2: Put apple pieces into a cocktail shaker. Add one teaspoon of sugar and a pinch of cinnamon, then muddle ingredients together using a wooden spoon. Step 3: Measure two ounces of applejack liqueur and pour into cocktail shaker. Step 4: Measure two ounces of fresh apple cider and pour it into the cocktail shaker. Step 5: Add ice to cocktail shaker. Cap with pint glass and shake vigorously. The shaking action not only stirs the drink, it has a muddling effect on the fruit. Step 6: Prepare a fresh glass with ice and garnish with an apple slice. Strain mix into the glass. For more fruit in your cocktail, pour mixture from the shaker using a wooden spoon to hold back the ice cubes. To strain fruit out, use a proper cocktail strainer. 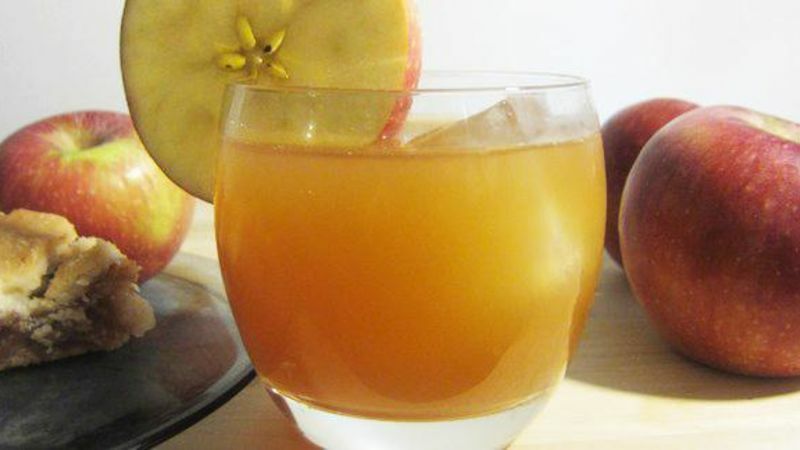 Garnish with an apple slice and you’ve got yourself a sweet apple pie cocktail, perfect for sipping on a fine fall day!